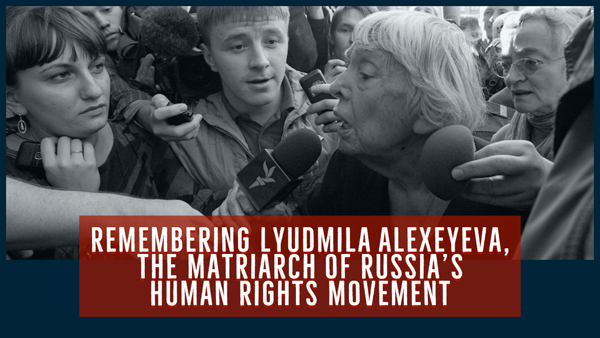 Lyudmila Alexeyeva will be remembered as a pioneering figure in the field of human rights. In 1976, she helped launch the Moscow Helsinki Group (MHG) – the first major independent human rights movement in the Soviet Union – to demand that the Soviet government honor its international human rights commitments under the Helsinki Final Act. She dedicated her life to activism, motivated by her belief that independent civil society and strong institutions are crucial safeguards for democracy and human rights. A staunch advocate for independent labor unions, she returned to Russia in the early 1990s after 16 years of exile in the West to assist the growth of the country’s nascent organized labor movement. The bold leadership of Lyudmila and the MHG were crucial to the growth and development of Russian civil society, and throughout her life Lyudmila remained an unwavering beacon and example for Russian activists, appearing at protests, conducting solidarity pickets, and speaking out for victims of human rights violations. A new generation in Russia has taken up Lyudmila’s struggle for human rights and an international order based on rules and values. As we honor Lyudmila and her contributions to Russian civil society, we will reflect on what can be done to strengthen the solidarity of governments and international organizations with those local activists continuing her legacy in the pursuit of higher standards of human rights and democracy. Senator Ben Cardin has worked across party lines to further U.S. national security and to ensure that good governance, transparency and respect for human rights are integrated into American foreign policy efforts. Senator Cardin has served on the Foreign Relations Committee since arriving in the Senate in 2007 and served as Ranking Member from 2015 to 2018. The Senator is also Ranking Senate Commissioner on the U.S. Helsinki Commission, and the lead author of the Sergei Magnitsky Human Rights Accountability Act, a law that imposes sanctions on Russian individuals and entities responsible for the death of Russian lawyer Sergei Magnitsky, as well as individuals who commit gross violations of human rights against rights defenders in Russia. Representative Tom Malinowski was born in Communist Poland during the height of the Cold War. When he was six, he and his mother fled to the United States – one of Tom’s earliest memories is his mother paying off a corrupt official, so they could get the passports that allowed them to come to America. After graduating college, Tom served as a Senior Director on Bill Clinton’s National Security Council where he worked to end conflicts around the globe while keeping America safe. He then served as the chief advocate for Human Rights Watch, where he led the bipartisan campaign to end the use of torture by the Bush Administration. These efforts led Tom to be recognized as a champion of human rights, and he was selected by President Barack Obama to serve as Assistant Secretary of State for Democracy, Human Rights, and Labor. There he led the fight for human rights worldwide by protecting vulnerable minorities, rooting out corruption, and standing up to dictators like Putin and Kim Jong-Un. Sergei Davidis is the head of the Political Prisoners Support Program and is a member of the Council at the Memorial Human Rights Center in Moscow, Russia. He was educated in Sociology at Moscow State University and in Law at Moscow State Law Academy. He has been involved in the Russian democratic movement for the past two decades, and is currently a member the Solidarity Democratic Movement. A veteran human rights defender and a coordinator for the Union of Solidarity with Political Prisoners, he has many years of experience organizing support for and raising awareness of the plight of political prisoners in Russia.